@onemanarmy: Hey, I was having a discussion with the guy about how old 26" forks they don't make anymore fit my new 27.5 wheels/tires. Your the one who butted in... You brought up the 831, Fox "trickle down technology" and the 500 dollar price point. Seems like you were asking for 1000 dollar fork tech for 500 bucks. Yes you do go back to the Z's. But you ended the whole thing about how everyone is on CRAP forks... OR 831's. SO it sure seems like your wanting a 50% off fork there? It's too bad Fox is using Zoke as their budget option. Cause the easiest thing to do is make a performance level 831. Aught to be nothing put pulling parts from existing bins and building them up? But I doubt they would sell it below $700. So I'm not sure that helps your request much. As far as the 26" DJ market. I really have no idea. But generally speaking, if a product catagory is successful it's full of competition. I was pretty surprised at the lack of of DJ MTB's available from the brands that used to be pretty deep into the business. And as far as getting a 26" Z2, the issue would be that you'd need enough OEM business to make it worth the upfront cost. And as noted above, frame only. Course there are for sure more than just those few big brands making 26" bikes. BUT those few big brands usually carry the whole OEM market? If those two companies you spoke to are selling everything they build than why are they doing LIMITED production runs...??? Kinda seems an oxymoron... Good talk. @onemanarmy: A Pike DJ is not a crap fork and is very bullet proof. I assume the new Debonair Deluxe Ultimate charger 2.1 whatever would be "better", never rode one. But your basically asking for the tech form $1000 forks to be sold less than half the cost so you can buy them on $1000 bikes? I mean who wouldn't want that? (other than fork manufacturers) But there is nothing 26" specific about that thought. EVERYONE would rather have high end forks for 50% of the cost... Then again if your putting 26" purely into the DJ Niche then how subtle does that dampener need to be? Per the other post, the Manitou Circus is also not a crap fork. And other than being a little heavier a lot of people are really happy with Xfusion these days. NO, they are probably not as good as 831's with a Grip2; but your saying that's overkill anyway, (which seems to conflict with your whole concept of wanting a really good fork for for half the cost?) Therefore, dampener opinions aside, any Dad in the US can walk into their local Specialized dealer right now and get the bike your talking about... Also, you don't "need" a 26" bike for DJ. Sure it's a little better since most DJ/pump tracks are built for the cadence of smaller BMX bikes. But for the occasional trip to the local pump N jump with the kids any real mountain bike will do. 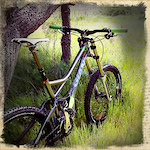 If you have a modern trail bike your golden with some suspension tweaks. 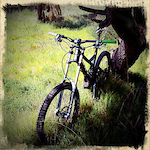 If you have a modern trail hardtail then done! Wheel size be damned. (most Dads standing on the side lines are doing that because they don't want to look like an out of practice newb! when they've told their kids how RAD they used to be! :) jkn. Obviously there are gonna be some Dads that money is holding them back. BUT "cheap" 26" DJ bikes have ALWAYS been available. GT, Mongoose, Haro, etc. 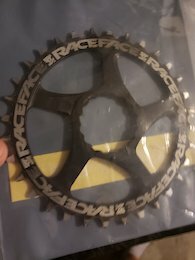 chainreaction) I just googled through most of the "old school" DJ mountain bikes and IMO if the STP, Chase are gone, Jackels, Tickets, Shonkey's are frame only. Then it's because people are just not buying enough of them to justify production. It's not because there aren't forks to spec. DUDE.... the cajones on that guy. Paraplegic to double blacks.... F**K You are an inspiration! thank you PB for sharing this story!! @onemanarmy: LOL, context. He was saying there was no reason for a dedicated 27.5 fork. Just replying in turn. Admittedly his old Magura is a 26" fork that takes 26x2.6 and therefore some decent 27.5 tires. But not 27.5x 2.5WT/2.6 tires on wide rims with mud clearance! And once you allow for all that especially without sacrificing in strength, weight, etc. you've just made it into a 27.5 fork chassis. Honestly, I have no dog in the fight. I think the "trickle" of 26 specific parts is just because there is a saturated "old stock" 26er market right now. So unless there's a specific sales niche that isn't being filled by parts sitting in warehouses it's risky to invest in new product development??? @vinay: Seriously dude....??? Your fork was specifically developed and sold as 26" and 650B intentionally. There's not a bait and switch or mislabel going on. That split arch is probably the only case other than an upside down fork that you could get a decent 27.5 tire in there. It was a good idea, but I assume there were other issues, or Magura still owns the rights? (since they don't make them anymore) Also your running 26Plus tires in there anyway. BB clearance issues? :) Your acting like manufacturers just slapped 27.5 stickers on their old 26" forks and sold them...? Not the case. As for MRP... They had been making/licensing White Bros forks. But when they started selling forks under MRP the stage fork was designed around 27.5 and 29. 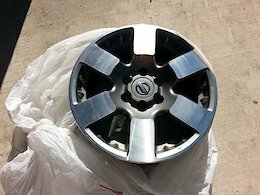 Yes you can run a 26" wheel in them. And yes they are marketing it as such. BECAUSE they don't make a 26" fork... 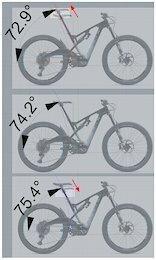 Most 29er forks are also marketed as 27.5+ too, doesn't change that it's a 29er fork. It takes more than offset to make a fork wheel-size specific.